Fresh and contemporary, these dangling Swarovski crystal earrings may become your favorite. The rose color makes a positive, current statement. Perfect square silver studs maintain the clean lines of the curved silver tubes. Unfussy and comfortable, these earrings can be made in an hour. Making loops is the only skill required. If you have doubts, check out the steps for making loops and eyes on my Jewelry Making Tools and Techniques page. The curved silver beads are sold in a package which includes a variety of sizes. step 1 - Gather together your supplies. You will need four short tube beads, four medium tube beads, two long tube beads, ten ball pin wires, ten crystal bicone beads, two jump rings, and two earring posts. step 2 - Feed a ball pin wire though a bicone bead and a long silver tube. step 3 - Bend the ball pin wire at a 90 degree angle against the end of the tube. The wire should be facing the inside of the curve. step 4 - Using round nose pliers, create a loop with the wire and remove the excess with wire cutters. The loop should be straight above the curved tube. step 5 - Repeat steps one and two with two medium tubes and two short tubes. Line them up with the two short tubes flanking the medium tubes and the long tube in the center. Arrange them with the curves facing in the same direction. step 6 - Slip a jump ring through the loops. 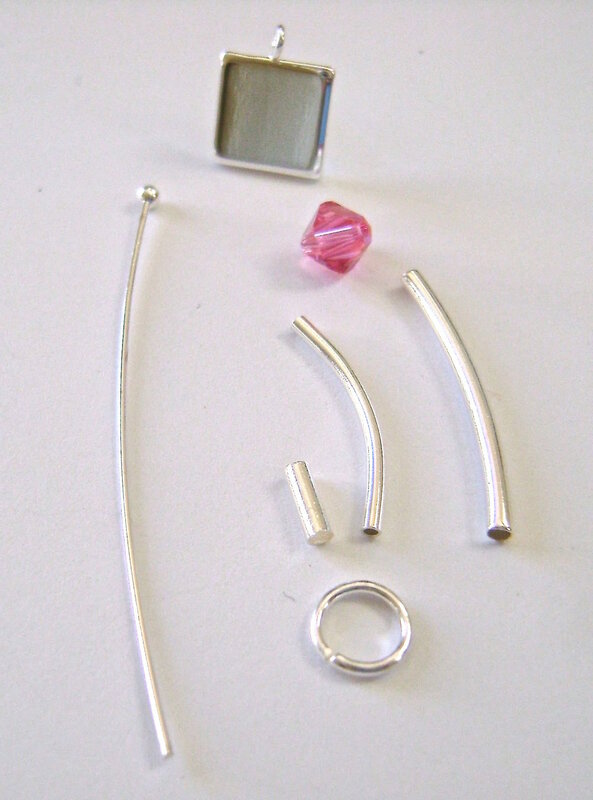 step 7 - Attach the jump ring through the loop in the earring post and close it with pliers. I bought my flat silver studs at my local Michaels store. Unfortunately, Michaels doesn’t carry everything that’s in their stores on their website. An alternative for the studs are some I found at Amazon. They are slightly different in that instead of laying totally flat, they are slightly curved. I found these after I made my earrings and actually thought these would better complement the design because the tube beads curve too. They are listed below in supplies.